The chosen few are set to announce their lists of the top tech trends that we should all be embracing or bracing for. The following isn't such a list. Mine is more of a list of things that I hope more people will pay more attention to. Which is why I wrote this list. Found a beautiful digitally-scanned collection of pre-1923 books; the library who scanned them claims copyright on them. WANT. TO. PUNCH. If you are part of a library or other not-for-profit that takes historical material and then places that material behind a paywall or makes the works available but with copyright restrictions, be prepared to feel a little less gratitude and a little more wrath for your labour. Better have an answer ready to this question: why didn't you add the material to the Internet Archive or to Wikimedia instead? Regular folk have been reading books on their e-readers for a handful of years now. How much longer will it be before these e-readers start adding new features that take fuller advantages of what digital text is capable of? I'm thinking of strange new features like Amazon's Daily Review. I was talking with a friend last week about music and he told me a story about how he uses his iPad for his collection of music scores. Not only does it store and makes available all this music collection, the software act as a metronome, can transcribe a score into a different key, offer hands-free page turning, and even play the score so you can know what the piece is supposed to sound like. Paper scores no longer sound so wonderful to me. If you are reading this blog post then you are probably old and if you are old then you probably have much of your own work and past reading material written in ink, embedded in paper, and sitting on shelves. The amount of effort required for the digitizing of your artifacts is probably too daunting to consider seriously. But if you were starting your scholarly career all over again, would you take the time to make just one corpus of material and make everything digital? When scanning a document more often than not requires a camera or even just a camera phone, why wouldn't you? Academic library systems are able to acquire and make available access to a large number of ebooks - largely because they have accepted many of the publishers' conditional terms for access: DRM, pdf format, and very strict downloading and printing limits. With these restrictions in place, scholars can read works but are not able to copy significant amounts of text for analysis or to manipulate the texts digitally. This raises the question: how soon will it be before we will regularly see scholars scanning their screens with their iPhones in order to make a copy of text? Discovery layers are a cargo cult for library administrators: build something that looks like Google (but is not Google) and the good times will return as our communities will leave the internet for the promised land of the library website. At my place of work, the use of Web of Science is an order of magnitude over most other databases. Why? Web of Science presents a small, understandable set of the most important journals that cover a long period of time, along with strong linking to full-text, meaningful connections between items, and adds the ability to download, sort and parse results sets. Discovery Layers do the opposite in every way. NCSU recently presented the results of a study of How Users Search the Library from a Single Search Box and the most frequent query of their library system- encompassing more than one percent of the total number of searches - was web+of+science. Discovery Layers: qui bono? Network analysis and visualizations are of great interest and importance because what they can reveal goes far beyond what we can intuit without machines. 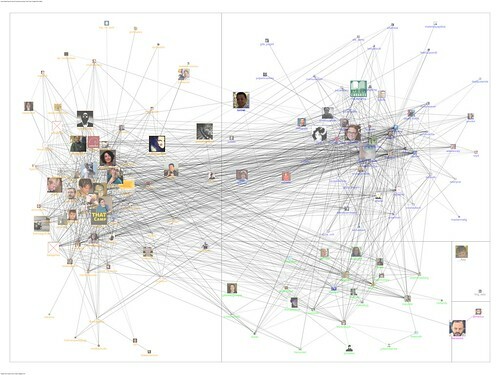 Network analysis and visualizations requires a whole set of new competencies that I have not seen much of in libraryland, with the exception of those on Team LODLAM, who enjoyed a breakthrough season last year. My message here is that we need to be creating data, not records, and that we need to create the data first, then build records with it for those applications where records are needed. Those records will operate internally to library systems, while the data has the potential to make connections in linked data space. Meanwhile, librarians are still teaching Boolean logic. That's a disconnect that I'm finding difficult to ignore. Speaking of disconnecting, I need to that now. There is much work to be done. This is what we can all agree on. A glut. A library. A flood. A review. I try to put in a chapter before bed and it's done wonders, not only for all the good things associated with what learning news things bring, but doing so settles my monkey-mind down so that I've been sleeping better. I read three related books in succession: one about the history of categorization, one about the history of libraries and the last about the history of information. While reading these particular books in quick succession will no doubt mess up my ability to recall which particular book contained which particular antidote, the upside is that I've had the opportunity to notice where they contradict each other and where they tell the same story but from different perspectives. For the Yaunde, the elephant is always “the great awkward one.”♦ The resemblance to Homeric formulas—not merely Zeus, but Zeus the cloud-gatherer; not just the sea, but the wine-dark sea—is no accident. In an oral culture, inspiration has to serve clarity and memory first. The Muses are the daughters of Mnemosyne. 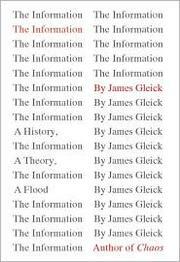 Information: A History, A Theory, a Flood is a drier read, largely because it is a history of information that has nothing to do with meaning. 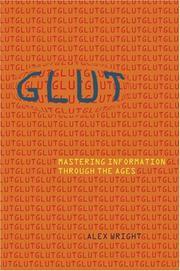 As such, there is scarce mention of libraries in Gleick's book. For that, you will have to read Mathew Battle's work. 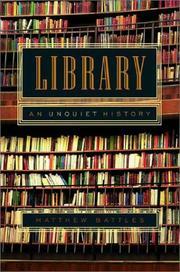 Be warned: Library: An unquiet history mostly reads as a history of the destruction of libraries over the course of civilization. It's hard not to conclude the cost of centralizing texts in one space is that you've created a single point of failure. It is just a matter of time before that price is paid; libraries fall with the empires that built them. These images of the librarian bring to mind Prometheus, the Titan who presented mankind with the gift of fire. Two things are worth remembering about Prometheus: first, that he is moved by one emotion, pity, and his gift ultimately inspires another emotion, hubris, in the hearts of human beings. The tragic flaws of the Promethean impulse, pity and hubris, are the emotional poles of the librarian in the nineteenth century as well: pity for the low station of the reader, and hubris for the possibilities the library offers for the reformation of culture and society. The second thing to remember about the myth is the punishment of Prometheus. For his transgression against the power of the gods, Zeus chains the Titan to a wave-battered rock by the sea and sends down vultures to eat his immortal liver forever. Actually there's another passage I think I'd like to mention. Chapter five also contains a reading of the history of the first public libraries that I haven't read elsewhere: while the radical Chartists did much to start the public library movement through the creation of reading rooms that were accessible to the working classes, it was actually the efforts of capitalist utilitarians who brought about the first public libraries paid by the state. While this particular history is fascinating in it's own right, I find it especially useful in understanding the current position of the public library in our society. For example, I think it helps me understand why hackerspaces in libraries are being so well received. Like Chartist reading rooms, the original hackerspaces began in Europe and were established by anti-capitalist "radicals" (I'm still waiting for Fiacre to write the article that I need to cite here). In North America, the hackerspace or Maker Culture movement is much less grounded in politics, although it does have it's own manifesto. One of the reasons why I think the partnership of Public Libraries and Hackerspaces have been so well-received is that hackerspaces are now being re-cast as technology/business incubators. It's not exactly history repeating itself, but it does sound like a rhyme to me. Actually, I'm not too worried about getting all the stories from these three books mixed up. I've got them all, indexed and searchable on my Kindle DX. I've got them backed up in my Calibre library, and I've got my favourite quotes on Amazon and in Readmill. And I have these words here. Stories get stronger with their re-telling. Over the last two weeks, I've been following many worried online conversations about SOPA and the newly hatched Research Works Act. One place where I hadn't read much about it was from my place of work so just now, I uncharacteristically spammed all my colleagues about it. If you would like to spam your own colleagues about these diabolical plans, feel free to use the text below as a starting or ending point. I don't mean to spam you all, but there are two pieces of pending legislature in the US that I think should be of interest to all of us. The first is SOPA, or the Stop Online Piracy Act, which is being described as having the power to "break the internet"
A number of academic publishers are on record supporting SOPA including: Macmillan (parent company of Nature Publishing), Pearson Educational, and Elsevier. The second piece of legislation is "The Research Works Act" and it's backed by the American Association of Publishers. This act seeks to circumvent open access publishing guidelines from organizations such as the NIH. The AAP/PSP membership includes many scholarly societies: American Association for the Advancement of Science, American Geophysical Union... as well as The Library of Congress, Ithaka (JSTOR), and the MLA. The legislators supporting this act receive considerable campaign funding from Elsevier. There are librarians working on trying to craft some sort of formal response to these acts. One activity in particular that I happen to support, is actively encouraging librarians to stop contributing their research and the labour to Elsevier titles such as the Journal of Academic Librarianship.